There was a time when marketing, and even getting feedback from consumers was so much more difficult. Businesses had to spend millions of dollars in advertising money to reach the customers and potentials. Then they had to spend almost as much to gather market data and feedback. Market research firms were making a killing, helping the businesses gather information. Social media has changed all that. It’s allowing business to reach out, connect with, and finally engage with people from everywhere in new ways. Social media is allowing everyone to feel connected, to become a part of one big movement. Sure enough, it started off as a source of popular entertainment. But social media is much more than that now. Businesses are able to reach their customers for much less money. But more importantly, they are able to keep them engaged in all kinds of ways, and by doing this, the brands are keeping their prospects in the revenue loop. But perhaps the one reason that makes social media so powerful is its Real-Time aspect. 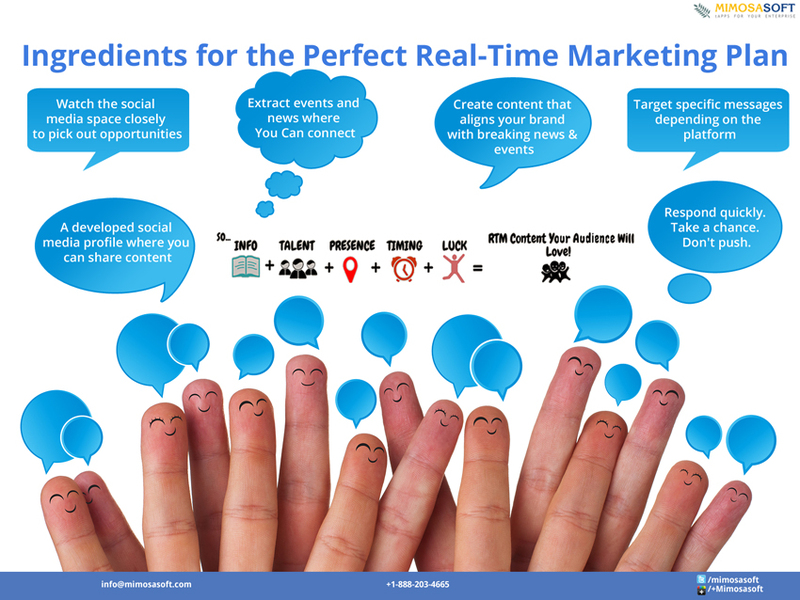 In fact, marketers have already coined a new term for this – Real-Time Marketing. If you haven’t yet heard about this, you can be sure that you’ll do so in the next few weeks and months. It’s getting big every day. In its basic form, RTM or Real-Time Marketing is observing real-time events, and then turning them into wonderful opportunities by becoming a part of the conversation. This involves community management, social listening and brand monitoring. The goal here is to engage with a large audience with the intention of changing behavior by putting brands within the conversation through social media. This is much bigger than just looking closely at the comments in your Facebook page, thanking the positive ones and addressing the complaints. Let’s take an example to understand this better. For instance, there were a lot of tweets during the Emmy Awards on “red carpet fashion”. Target Corporation, the retailing company from the US had a smart strategy. They were able to add value to conversations by showcasing their products that people can use for mimicking the same fashion trends. This is Real-Time Marketing. They were able to connect with hot prospects in real-time by joining the conversation as it happened. Oreo too had a smart real-time strategy. During Super Bowl 2013, they managed to steal the spotlight with their tweet that went like this – “You can still dunk in the dark”. Oreo planned it well around a national television event. This message was retweeted more than 16,000 times. Watch the social media space closely to pick out opportunities. Have a web reputation management plan in place. Plan a strategy in advance. Gather resources for preparing the campaign. Target specific messages depending on the platform. Use multi-channel posts for spreading the messages quickly. Explore different ways of spreading a message even further. Creativity and good timing are both going to be very important. Brands are often going to take chances with their messaging, without making it too risky. Quick response time is going to be very important. But RTM can go wrong as well. And so, marketers have to be really carefully. The wrong approach could backfire and spread fast in real-time and mess up everything. Force the messaging. Worse, force the idea. You cannot be a part of the conversation if it is not working naturally. There are brands that are just not listening to the conversations closely, and then adjusting their Real-Time messaging accordingly. It’s not going to work if there is no connection. Sometimes, a brand that’s talking about something that’s not quite related might just squeak by. However there is every chance that the brand will end up looking really ridiculous, or worse, desperate to catch the attention. Promoting tweets with hashtags that are out-of-date or aren’t that popular for pushing their efforts.